I"ve pasted the email I received from Cycling Vision Ottawa this morning, FYI. 1. Final sprint for Lane Laurier - Your presence wanted Feb 2! 5. Dr. Schiller writes "At 74, I bike everywhere"
7. 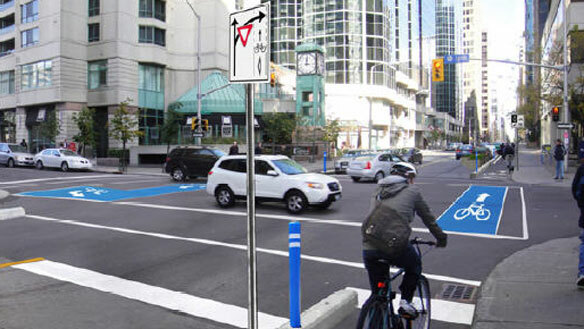 Segregated bike lanes quadruple cycling in Vancouver! 1. Final sprint for Lane Laurier: Your presence wanted Feb 2! We're in the last lap and headed for the finish line this Wednesday, February 2nd at the critical Transportation Committee meeting. A show of support may be crucial! The presence of supporters during this meeting would highlight to councillors the importance of the pilot project. People walking into the meeting carrying a bike helmet would be one way to quietly illustrate interest in the Laurier segregated bike lane. It would be great if you can attend even a small part of the morning. You may come and go as you please during the meeting, but no overt demonstration of support is allowed. Decorum is required. The Champlain Room is located in the older portion of City Hall accessed via an overpass on the 2nd floor from the newer main building. Use the main entrance on Laurier Avenue West or Lisgar Street, east of Elgin. On the second floor, follow signs to the older section of the complex and the Champlain room. Be aware that the meeting location may be changed at the last minute to accommodate larger audiences. Observers may quietly enter and leave the meeting at any time. Many of you have sent us comments in support of the pilot project. Thank you! They have been useful for the campaign - and most heartening for us to read as well. We've met with most of the Transportation Committee members to discuss the project, with just one meeting left before the TC meeting. We believe there is enough support among the councillors to get a positive vote for Lane Laurier. But there is stiff opposition and nothing is certain. A show of support may be critical! Billy Downer lives in a condo building at the West end of Laurier Avenue and he supports the Laurier bike lane project. In his letter to the Ottawa Citizen published Saturday January 22, he writes that the property management company is spearheading the opposition against the Laurier cycling lane project. He adds that he's not aware the building's board of directors had a mandate to act against the project. He also describes how a similar project in Toronto went ahead in spite of the opposition. The feared negative impacts on parking and businesses did not materialize. Bringing experts to Ottawa is a useful way to encourage and assist the city to reach its cycling targets and to develop local expertise. We would like to bring another expert to Ottawa this spring. Your financial support to help us do this would be most welcome. Please take the time to consider a donation to Cycling Vision Ottawa. A cheque is welcome by mail to Cycling Vision, #572, Station B, Ottawa, ON, K1P 5P7. Or contact us at: donate@cycling-vision.ca . Unfortunately we cannot issue tax receipts. Thanks in advance for your generosity. 5. Dr. Schiller writes "At 74, I bike everywhere:"
A British biking success story bodes well for Ottawa's Laurier Avenue bike lane pilot project. Transport for London recently reported a huge increase in trips by bicycle since launching its first two Cycle Superhighway routes this past summer. The municipal government found the total number of cyclists doubled on one route, and increased 50% on the other between October 2009 and 2010. A city press release quoted the Mayor of London's Transport Advisor, Kulveer Ranger, saying: "It is great to see that the first two Barclays Cycle Superhighways are well on the way to achieving our goal to increase cycling in the Capital. "This research shows that people do believe the routes are of value, make them feel safer and are allowing them to take direct and continuous routes into central London." 572 - 57 Sparks St.
1) it is a pilot project. If it doesn't work so be it. We spend millions (actually billions in action plan money) on roads each year and no one says boo about it. That's just odd. 2) its intention is to get more people riding to/from work at rush hour. Rush hour brings huge huge tax burdens to us all as everyone wants on the infrastructure all at once. They built that kanata extension at a cost of 155Million, it just brought more cars! more cars equals more need for more infrastructure! This means more tax dollars! Yikes! with this bike project, hopefully, it removes many vehicles from the rush hour time period thus relieving congestion thus decreasing tax dollars spent on huge infrastructures to house just one person in 3000lbs of metal. That's odd. 3) it is just one street. If people still need the "fear factor" or the buzz of being in traffic - go do Wellington! its a blast! 4) more family oriented. Sure, there are those that whine every day - its not safe having this boundary, we'll get kicked off the road. Is that what we have become? this city so instilled with impatience now... Families, aged, and disabled deserve protection from this impatience and hyper panic society we are becoming (get me there quick). This little project hopefully will provide that comfort zone away from the hustle and the bustle of the city. I hope. 5) as the population of ottawa grows, most recently due to the government hiring spree (2002-2009), more vehicles are on the road than ever before. Disposable income is high in some age brackets and everyone wants to drive due to the convince factor. This bike project will hopefully allow for those that can not afford this "luxury item" (vehicle - it is suppose to be a luxury item, but now, it is a driver for our economy, so everyone seems to have one... good on those that have refrained... I have a deep respect for those that can do without... thanks goes out to those that take that challenge!). 6) we need alternatives. And, this is just one of them. 7) it may actually increase business downtown, as people will now mingle about and get off when they please. Currently, people drive to their destination and get out without smelling the roses. No more exploring. Just encased in metal cages. 8) the social aspect of the city might light up. As more cyclists say "gi-day eh!" riding to/from work. in a vehicle, we are social misfits really. stuck in a box with blinders on. Its a very anti-social atmosphere as we hide away in a metal cage like a baboon in hyper mode (in a hurry). 10) and, pure people power. Cheap. Raw Energy. Forcing thy muscles to work as we have evolved over thousands of years to do so. Think of what we have become really, people press a button to make their breakfast, they press a button to start their vehicle, they press a button to get them to work, then they press buttons to do their work etc... is this evolution? get your dose of goodness... get on your ride! this bike project just adds a bit more freedom for those that need it. If someone doesn't like it... just choose another root. Simple. its a pilot project... read thy lips and get out there as you may. we must keep in mind, that the intent of this is to get more "common" folk out there cycling. If a little wall will do that, then so be it. And, the poor rely on bikes to get around. Are we going to burden them further. I hope not. are cyclists the biggest threat to society anyhow. I don't think so. Read this book: Hot, Flat and Crowded. Its a good read. that there are some cyclists in ottawa that are very selfish. They don't see beyond their doorstep. A whole bunch of people just trying to get by day-by-day. Some don't feel comfortable biking with the masses (traffic) during rush hour. The intent of this pilot project should be to make feel comfortable. If it achieves this simple little goal then so be. It is unfortunate that pedestrians and cyclists aren't high on the priority list, and hence the after thought of putting in an infrastructure for them (after we polluted the roads with vehicles of course). Will we learn from our mistakes, probably not. We'll keep making them. Pedestrians and cyclists are last on the list. lets just give it a go! that's a very ironic picture (for me at least) because that is the very spot I was hit by a van pulling a u-turn on Laurier. He didn't see me coming down Laurier and ran right into me. Luckily I wasn't hurt, but I'm glad this lane is going in because it's part of my daily commute.